Jose Mourinho believes that despite Real Madrid’s 3-2 defeat by Malaga before the winter break, his decision to omit Iker Casillas was a success as it showed that coaches continue to pick teams. The Portuguese’ selection of Antonio Adan between the sticks instead of the club captain caused many fans to raise eyebrows, and the Blancos subsequently lost at La Rosaleda. 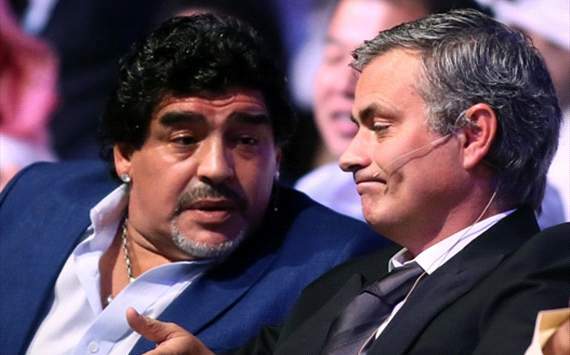 However, Mourinho – who was talking at a conference in Dubai alongside Argentina legend Diego Maradona – played down the defeat and hailed the influence of coaches continuing in modern day football. “Maybe it looked like a bad week, but the outcome was fantastic,” he told reporters in UAE. The Blancos return to Champions League action in February against 2010-11 finalists Manchester United in the last 16 of the elite European competition. The former Chelsea boss also talked about former United player Cristiano Ronaldo, who will likely play a key role in the matches, and Mourinho praised his star player’s effort to succeed. “He’s a star, everyone wants a player like him, because of his character and his determination,” he said. Mourinho also rubbished reports of him taking Carlo Ancelotti’s head coach role at Paris Saint-Germain any time soon, and wished the Italian all the best at Parc des Princes.